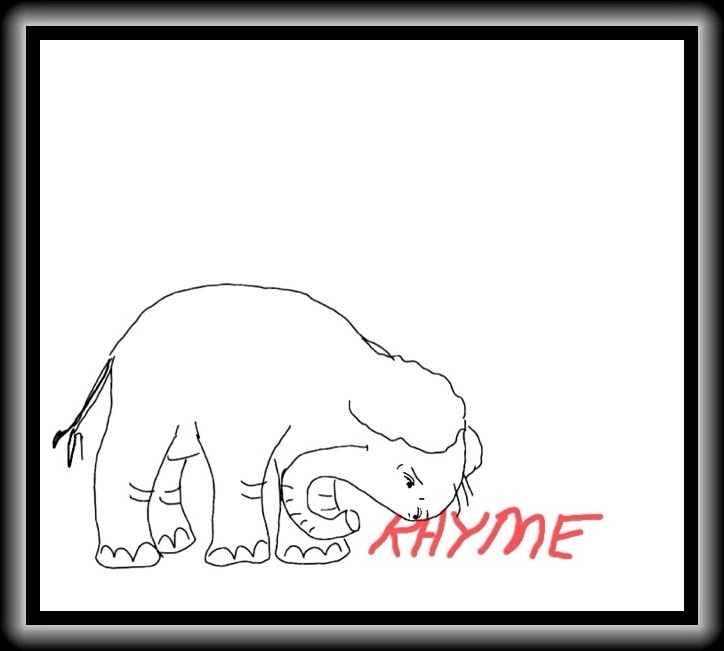 This elephant does not fully understand slant rhyme. Hey poets! Manicddaily, a/k/a Karin Gustafson, here in my first “Meet the Bar” challenge asking you to take a new slant on your writing. Slant rhyme! I always think of it as rhyme that doesn’t quite. 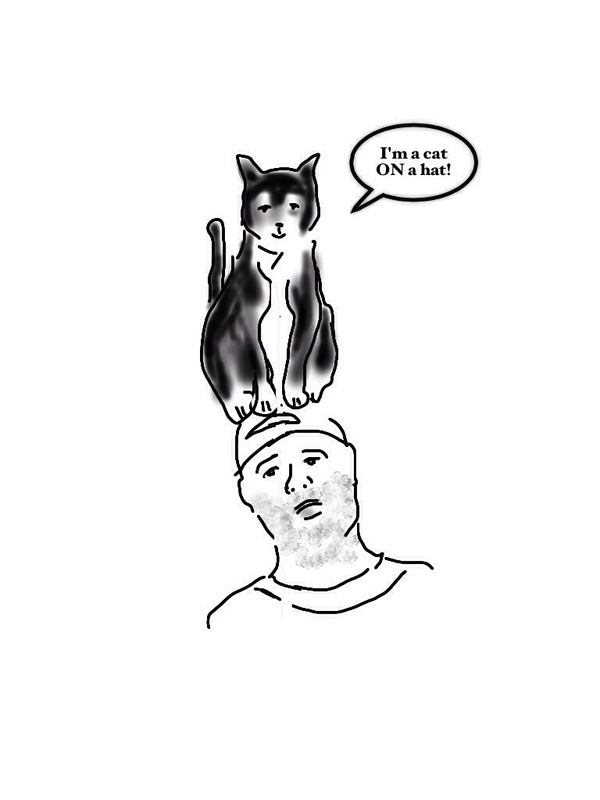 Slant rhyme is imperfect rhyme, half-rhyme, rhyme that don’t fully stuff the cat in the hat, but let the cat’s head or tail or even whole mid-section lounge about the brim. This cat does not at all understand slant rhyme. Slant rhymes (to my way of thinking) are very effective in serious poetry as they allow for some of the music of a rhyme without its silliness. At the same time, a serious poem with no rhyme can sometimes edge into the prosaic. Storm, room, firm, room, be, fly. So, Poets, your task today (if you choose to accept it) is to incorporate slant rhyme in your poem, i.e. get bent! Finally, slant your way over to your other poets to check out their posts. See you on the diagonal! • Write a poem using some kind of slant rhyme and post your poem to your blog. • Check up on other poets. Read and comment on other people’s work. • Share, if you like, via your favorite social media platforms. cool theme karin – and happy slanting everyone!! Hey all–sorry, I am at work and so will not be able to comment much for a bit, and then will be on a train, and using iPhone–but will visit all! 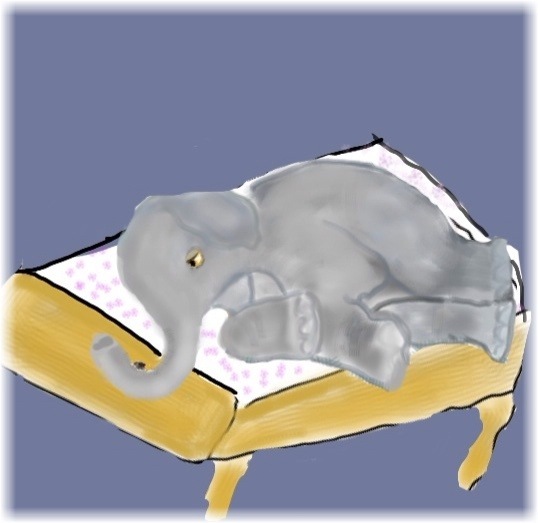 The elephants thank you for kind words–the one on the cot is sorry to be so grim! k.
Love your illustrations Karin. I have been off on a period of extended blog-avoidance, but will see if I can overcome it. it’s good to see you hedge!!! Ha. Thanks. I felt a little bad to illustrate the Dickinson as it’s quite a serious poem, but I had the little elephant lying around so couldn’t resist. I’ve not written mine. k.
smiles. would love to see another poem by you…i miss you…. I miss you too when I’m away, bri and thanks Claudia and k for the welcome—-I’ve been so busy it’s silly, really, for a retired old woman, but fun. I will be by this afternoon to visit around the pub. k, love the prompt…i use a lot of slant rhyme as it is to create rhythm and movement ina piece….had fun with this one though…..
Hey Brian–have not been able to check into any poems yet, but in a bit, I hope! k.
Much enjoyed your poems, Shanyn. k.
Good luck with the planting. k.
PS Such a marvellous Dickinson poem you chose, and one I hadn’t come across before. Her uncorrected punctuation of dashes really does work, if one reads it that way. Hey Rosemary! So nice to see you and glad you liked the Dickinson– k.
i knew it as b rhymes as well…. Hi K, I enjoyed the prompt. Not easy…but I enjoyed the challenges. Hey Mary–no it is not easy! But you did a great job. k.
thanks – this is a valuable tool. Glad you think so. k.
Hi Sumana! Probably some of both! k.
A great prompt: I much prefer half rhyme, slant rhyme, assonance and consonance to the full-blown rose and nose variety. And the end of the line is not always the best pllace for them. Bravo. I also much prefer slant rhyme, but warning: I was feeling rather silly this Friday (it’s been a week of tax returns, school registrations and other silly admin boredom), so my poem is a bit wacky and childish! I am always in the mood for silliness. k.
Thank you Karin, I have been absent of late and don’t think I can make this one either. Not for want of trying…or possibly -smiles. Good luck poets. Emily Dickinson is on of my absolute favourites. I enjoyed this prompt. Ha. I will check out! k.
Your illustrations brought me back here, K. They’re irresistible. I leave you a little snippet of a big heart. Oh, thanks so much, Susan. Your kindness is much appreciated. K.
That’s great. Thanks, Bjorn. k.
Hey Grace– thanks for joining in– enjoyed those slurping clouds! K.
Thank you, Imelda. Much enjoyed hearing about Philippine rain. K.